Florentine painter Giotto revolutionized the depiction of the human form. There’s been almost seven hundred years of chatter about Giotto di Bondone (about 1267–1337), a painter from Florence considered one of the greatest artists of all time. During his lifetime, Giotto was heralded as an artist who revived the art of painting, which some felt had fallen into ruin over the course of the Middle Ages. He was famous for painting on a monumental scale, demonstrated by his majestic frescoes in the Scrovegni Chapel in Padua. Ever since the 14th century, Giotto’s name has been synonymous with the early Renaissance in Florence, and his reputation has cast a long shadow on the art of the period. Writers such as Giovanni Boccaccio and Giovanni Vilanni, who were contemporaries of Giotto, championed his ability to depict the human figure as a believable form with mass, as if drawn directly from nature. The above detail demonstrates Boccaccio and Villani’s points. Notice how Giotto painted the garments of these five female personifications of the virtues by applying subtle variations of color to create a sense of volume in the fabric, thereby revealing the figures’ bodies underneath: the contour of an elbow, the curve of a shoulder, the bulge of a knee. O empty glorying in human power! If it’s not followed by a duller age! Some explanation is probably in order. Cimabue is considered the master artist who trained Giotto in the art of painting. According to Dante, Giotto’s reputation had eclipsed Cimabue’s, despite the fact that Cimabue was also considered a revolutionary painter at the time (read more about Cimabue here). 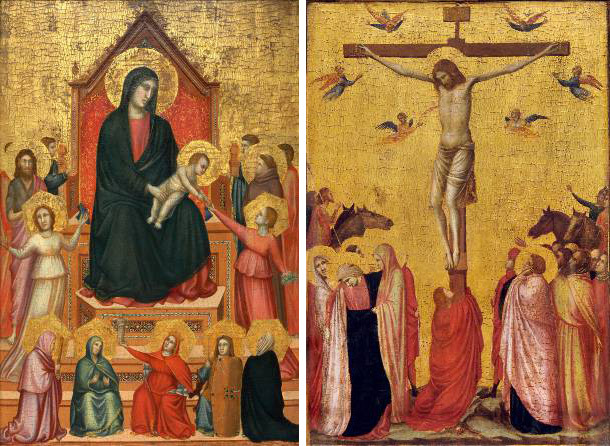 Take a look below at a famous comparison between the two artists and keep the images in mind as we hear from others who have written about Giotto. 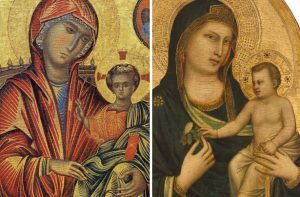 Note, for example, in Cimabue’s painting how the garments worn by the Virgin and Christ shine with golden lines, known as chrysography, a stylized feature common in Byzantine paintings. The figures in Giotto’s image, by contrast, appear sculptural, having rounded forms and a clear sense of weight. Around the year 1400, Cennino Cennini authored one of the most important early treatises on artist practices. Writing about Giotto, Cennini noted that the elder artist “translated the art of painting from Greek to Latin.” By this he meant that Giotto had moved away from the “Byzantine” manner of painting, often characterized by stylized forms, patterning, flatness, and otherworldly-looking figures. Lorenzo Ghiberti, the great sculptor, wrote similarly that Giotto’s art rejected the Byzantine style and returned to the rumored excellence of ancient Etruria and Rome. 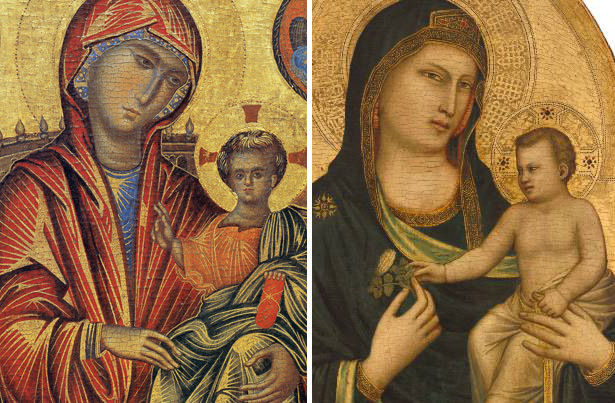 When we compare Giotto’s Madonna and Child (below right) with a Byzantine icon from the end of the 1200s (below left), we can see how Giotto uses light and shade to suggest musculature, and how he depicts subtle expressions on the faces of both Mary and the Christ Child. In Giotto’s Crucifixion the Virgin Mary, overcome by sorrow, collapses into the arms of two other women. Across the way, John the Evangelist clasps his hands to his face in mourning as one man points and others gaze upon Christ’s lifeless body. In the modern era, beginning in the 19th century with scholars such as Jacob Burckhardt and John Ruskin, and continuing into the 20th with art historians Richard Offner, Roberto Longhi, Millard Meiss, Luciano Bellosi, and Miklós Boskovits, among others, scholarship on Giotto has sought to more clearly understand the extent of his artistic production. 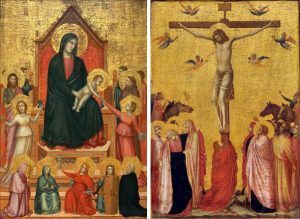 In 1937, for example, the Galleria degli Uffizi in Florence presented the exhibition Mostra Giottesca, which placed works by Giotto in the context of painting, sculpture, drawings, liturgical objects, and illuminated manuscripts from the late 13th century to the mid-14th. 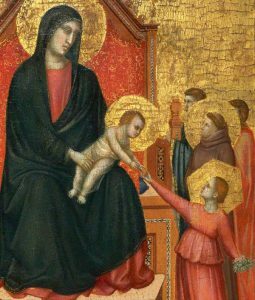 There have been several “Giotto” exhibitions in Europe since 1937, and most follow a similar format and bring together the same vast range of art objects in different media. We hope that the focus of the Getty exhibition on panel paintings and illuminated manuscripts will enrich our understanding of Giotto’s influence as well as our appreciation of his equally innovative contemporaries.